You’d have thought that with all the plodding around I might have slimmed down a bit, but as there’s no setting out foot without gastro attached and with Spanish temptations tickling an ever-ready appetite, we ate fabulously, well and mediocrely; never badly : with some judicious shopping and despite the facilities even eating in was pretty good – and filling. yema tostada turrón – already nearly all gone! 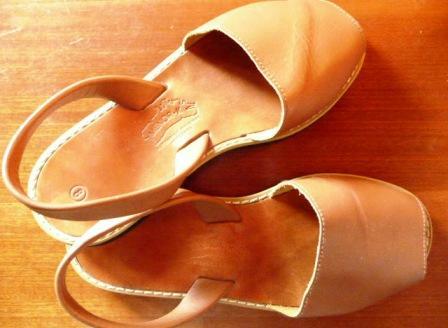 no tacky touristy belt but avarcas – traditional, practical leather sandals with soles made from used tyres – worn by the locals and totally eco-fab, baby. 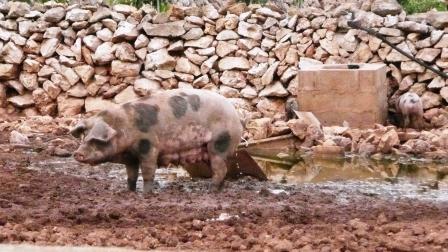 We sniffed out the quietest piglets on earth the other side of one of those dry stone walls and perched on tip-toe to say hello every time we plodded by en route to the DISKONT supermarket or Ciutadella. This is one of their mothers. I waited for her to stop tinkling before taking a snap but she just didn’t; good for her. I only wish I’d known Mahón (that’s Maó in Català) airport has a jamón bar next to Departure Gate 16 before I purchased my (admittedly fairly delish thanks to the piquillo peppers and olives) tuna mediterraneo baguette: a platter of Ibérico ham plus a couple of glasses of Rioja would have made a preferable adiós, amigos, but the silent T had already joined the queue at Burger King for his bacon-double-cheese fix so I perused the shopping selection and sighed. Well, at least it wasn’t McD’s.